Whether you are planning on saying “Be Mine” or “See Ya” to your sweetie this Valentine’s Day, there’s no easier way to put your thoughts together than through a few Conversation Hearts. These heart-felt talkative treats are enjoyed by millions of Americans each year. In fact, Americans have been enjoying the candy we now call Conversation Hearts since the 1800s. 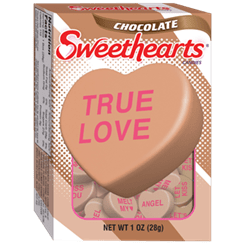 Made by several companies, the Sweethearts brand (my personal favorite) shares a history with another longtime favorite of mine, the much loved NECCO Wafers. Daniel Chase created the idea for the first conversation hearts in 1866 by devising a machine that would press food dye letters onto the candy lozenges made famous by his brother and NECCO founder Oliver Chase. The Conversation Hearts we know and love today came to be in the early 1900s. 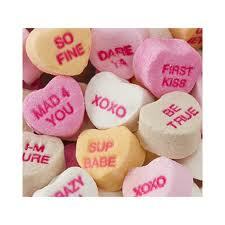 Today NECCO manufactures 8 billion Sweethearts year ’round to meet consumer demand. In honor of NECCO’s 150th anniversary, the original phrase “The One I Love” also reappeared in the mix. In the early 1990’s, NECCO’s then Vice President Walter Marshall began an initiative to update the sayings each year, retiring some while adding others. The first new phrase, in years was “Fax Me” which met with a bit of controversy from diehard Conversation Heart fans; but now you can find hearts that suggest a would be lover “email me”, “text me” and “tweet me”, too! And they come in Chocolate and are Gluten Free…Gotta Heart That! While all Conversation Hearts have been certified Kosher and gluten free from the beginning, the flavors have made changes with the times. It all started with the original eight familiar flavors customers found in the company’s Necco wafers: orange, lemon, lime, clove, chocolate, cinnamon, licorice and wintergreen. Now there are just six different flavors of hearts in box. To make this sweet candy confection, six simple ingredients -sugar, corn syrup, gelatin, gum, colorings and flavoring – are blended together into a mixing machine, one color and flavor at a time, until they turn into a soft dough. The dough is fed into a machine that presses the dough until it is flat, a process called sheeting. The sheeted dough moves on to the cut and stamp station where the sayings are applied on the dough and a large machine cuts the dough into 100s of little hearts. Next, the sheets of cut hearts go into a drying tunnel for about 30 – 45 minutes. The finished hearts are lightly dusted with cornstarch and moved to a drying area where they cool and harden during a twelve hour resting period. Once the hearts have cooled and dried, the starch is dusted off and flavors are mixed together to provide the assortment we find in each box or bag. Each year NECCO reports that they receive hundreds of saying suggestions from romantics, candy lovers and school kids, alike. Think you have a good conversation heart phrase to add to the collection? Sweethearts NECCO is happy to accept suggestions for sayings from their consumers. Each saying can be no longer than two lines of four letters on the small hearts and two lines of six letters on the large motto hearts. You can either e-mail your suggestion to the company via their website at Necco.com, or mail it to Sweethearts, NECCO, 135 American Legion Highway, Revere, MA 02151. Why not surprise your sweetheart or your best friend this Valentine’s Day with a box of conversation hearts and reservations at any one of my upcoming At Home with Heidi cooking classes. The list is on the home page of my blog at HeidiBillottoFood.com – just shoot me an email to make your reservation and I’ll be back in touch to confirm the delicious details.